Mono-Blue Wizards! A Commander deck you shouldn’t be surprised was my first. I love it having the ability to be milling people out and just drawing cards. Sitting back not doing much to other people, letting them get on amongst themselves as you build up a board of havoc and draw engines! This is not a typical blue build as It doesn’t run a lot of counterspells and is a lot more creature focused. 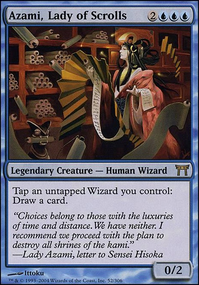 Azami, Lady of Scrolls lets you tap untapped Wizards for you to draw a card, which is totally fair and innocent. Nothing broken here, look elsewhere. So it may not look like a very blue deck having 32 creatures (Don’t panic) but this is Wizard tribal and a lot more themed like control than you would think. The deck uses Azami’s ability to the max by tapping all your Wizards and drawing all those sweet cards. Hopefully having no maximum hand size it can get pretty hectic and you’ll quickly find yourself in a position where you will have pretty much a solution to anything in your hand and can keep things under control. A deck which wins by milling yourself out and then playing Laboratory Maniac as the simple win con which is easily achieved by drawing your whole deck or by using the lock between Azami, Lady of Scrolls and Mind of Matter. You can also win by milling other players out with the use of Jace’s Eraser and Sphinx’s Tutelage, which lets you go around the table, milling each person out quickly. Elixir of Immortality keeps you from loosing and shuffling everything back in (always carry protection guys). The Jace’s will help you lock the game out if no one deals with them or just simply win you the game. The final win-con, of course, is just beating them down, using the Master of Waves to make a whole board 2/1 to end the game. Cards like Propaganda and Back to basics can really slow others players down and put them off attacking you, yes we do play non-basics but we only really need Blue Mana to do anything drastic. Patron Wizard is a really good card in certain situations, players lands not untapping and then being able to tap Wizards to counter spells? I mean what a joke! even I’ll admit that. With all this going on with Venser’s Journal will really help you get the life back if you took a beating in the early game, or get you too far ahead for damage to lose you the game. Howling mine, Well of Ideas and Dirate of Kruphix are cards which people won’t mess with it as it helps everyone in the game and people love drawing extra cards! Ponder, Brainstorm and Preordain is the three best draws which can help you sent up your plays for future or help find key pieces for Long-Term Plans which is a little gem of finding the card you need. There are loads of cards to talk about and if you have any suggestions or thoughts on the deck let us know! Previous Post So you’re thinking of getting back into Standard.